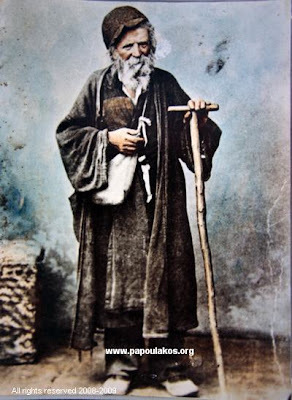 Yesterday (January 18th) was the anniversary of the departure of a great ascetic and hero of modern Greece, Monk Christophoros Panagiotopoulos, who is popularly referred to as "Papoulakos". 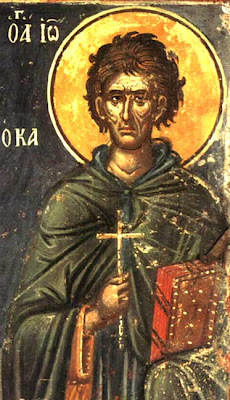 He was a contemporary of St. Kosmas Aitolos, and similarly helped to revitalize the spiritual conditions of many Greeks, especially in the Peloponnese, and suffered persecution and imprisonment, which however never broke his spirit. He has been locally recognized as a Saint in many locations in Greek and beyond, and he is honored by many as an exemplary monastic, miracle-worker, prophet, confessor of the Faith and a teacher, especially of the common people. May he pray for us all! -A Greek site with a lot of information and pictures. This is very roughly translated and slightly rearranged and summarized from the page "Iερά Mονή Μαλεβής" on the Church of Greece website (http://www.ecclesia.gr/greek/monshrines/malevi.html). I believe it is originally from Nun Anysia from the Monastery of Panagia Malevi, and it is her re-telling a short history of the Monastery, along with her account of the great miracle. There are many icons of Panagia that throughout the world and throughout the centuries have been shown miraculous by the Grace of Christ and the Theotokos, but this is particularly striking story. For over forty years, the ancient Icon of the Dormition of the Theotokos (called Panagia Malevi) has been exuding Holy Myrrh which is intensly fragrant, and has helped work many, many miracles throughout the world. May Panagia continue to watch over all of us and protect us, who venerate her Sacred Image, and who worship her Son. The first Malevis Monastery was built on a high place called Malevou which is now called Kanala in the isolated and trackless forests of Malevou. The chronical book of the monks states that the first monastery was founded in 717 AD, but a year later all of the Monks died, and the final monk, seeing his inevitable end, left a hidden message of what transpired. From that time other monks decided to leave this monastery at “the Channels” and re-build the monastery at another, lower location. On Parnon mountain, which has an altitude of 1937 (m? ), the old ruins and are being found of approximately seventy Christian monasteries. 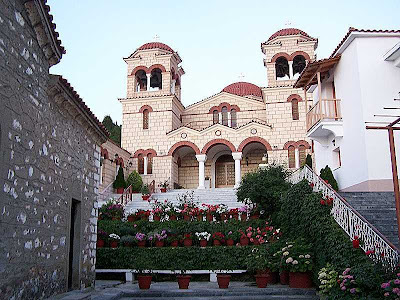 The Monastery of Malevi is one of the oldest monasteries in the region of Parnonos Mountain. 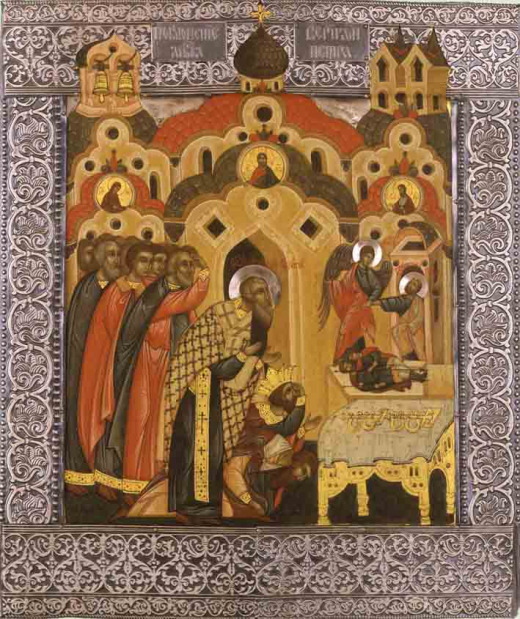 Because the honor and veneration of the Theotokos was especially important for the monastics, many of the monasteries were founded in memory of the Birth of the Theotokos, her Dormition, or others to her honor. 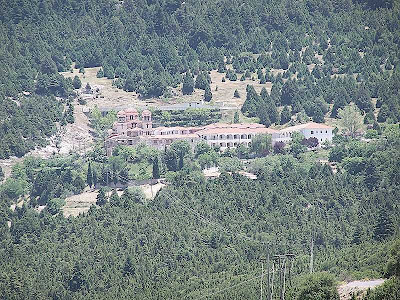 Since the original monastery was built on the site previously called Kanaloni approaching the top of Malevou, the Monastery became known as the Panagia of Malevou was slowly Panagia Malevi or simply Malevi. The Monastery is therefore ascribed to the year 1116 AD for its foundation, while the old Monastery was built in 717 AD. The miraculous Icon is traditionally known as one of the seventy images painted by the Evangelist St. Luke. The icon was brought by residents of Mount Athos to the first monastery in the Canal. Following the tragic end of the monks who died due to the extreme cold and the roaring winds, it was left alone and came to the place it is today. It repeatedly was found in some local bushes, and was constantely found illumined by a divine light. Three attempts were made to move the Icon to no avail, so a church was built at that location in 1116, and in the year 1362 the silver covering was added to the Icon. I have profound emotions and my soul is brought to heaven when I ponder the divine Myrrh, which flows from this miraculous Icon. How many were left speechless trying to tell and explain it. The Myrrh is unlike anything on earth. The Myrrh is not similar to the Myrrh which flows from various Saints. It is unprecedented Myrrh that our sweetest Jesus graced us with as a very precious gift to His Ever-Virgin Mother. And hear how it was revealed. In 1964 before the Holy Myrrh ran down the Icon of the Theotokos, for twenty days an indescribable aroma was present around the monastery. The Icon smelled beautifully, but initially it was not understood to be a miracle and people asked one another «Are they putting perfumes on the icons?» But no one knew anything. A Father Stilianos asked «What kind of perfume are you using?» and the nuns replied «We aren’t putting anything on, Father». 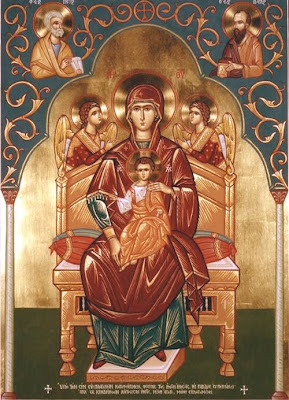 The Friday of the Final Chairetismoi [Salutations Service to the Theotokos in Great Lent] on the 17th of April, 1964, pilgrims had come for the Vigil. The first drops appeared. Sister Theonymphi saw them first, and then the Pilgrims ran to see them. I had not gone to the Vespers service. I ran to the church, I took a candle and gazed at the Icon and saw the Panagia open and closing her mouth and something like a fountain running out. When she opened her mouth, as much as a running tap would flow up, and it would stop when her mouth was closed. And when she would reopen her mouth the fountain would run again, but upwards. And the water that filled the frame was clear. The stand [proskinitari, stand that holds up an icon for veneration] was full, and that which flowed outside was as the color of milk. We were shaken and afraid, and no one slept that night. On Monday morning Panagiotis Kolovos came from Agio Petro. He went to venerate the Panagia, and came to tell us that there were drops outside of the frame. The Sisters went and saw a few drops from outside of the glass and the color was the color of the sky, blue, and the aroma was very strong. That afternoon, the Gerontissa [Abbess] Parthenia returned and we related to her what we saw and she remained speechless; she didn’t know what to tell us. Was this a miracle? Because we have never heard of the miracles of the Panagia like the one we’d seen. The next day we saw again a few drops from the center towards the outside. The frame did not hinder it, and it ran out of the frame and down the stand. The color was all-pure like a diamond, and had an aroma. On the next day, Wednesday, they subsequently ran at intervals several times a day. The color was a golden yellow like lemons or yellow oil, and it ran so many times that we filled half a bottle, we sealed it, and the next day the vial was empty. To us who witnessed this first, the miracle was traumatizing, and we cried. I did not know what kind of sign this was and what was its meaning. Would it signify a catastrophe? What could we say? The sixth week of the Great Fast, the week of the Palms, was for us days of lament and weeping. One day we rang the bells throughout the day but nobody came. They heard the bells as they told us later but did not come. We were alone. We notified the Diocese, and Priests of Metropolis came, took the Icon from the stand, wiped it, and inspected it to confirm themselves with their eyes the miracle of the Panagia. The Police came, the people came from their villages, some by motorcycles, other with animals, others walking to venerate the Panagia. The police put everyone outside, and locked themselves into the church by themselves. We could not see what they were doing. The Policeman said that when he wiped the Myrrh, more would flow from the face of the Panagia, and he said «I believe, Panagia». The icons smelled beautiful, the stasidia [seats along the periphery of the church], the the whole church, the whole monastery. Even the cars of those that took pieces of cotton dipped in the Holy Myrrh smelled. The aroma was so strong that it reached the lower road, so strong it was. The Myrrh would run down the stand several times a day and reached the floor, and we gathered it with cotton and gave it to everyone. There were so many people, and we would read Chairetismous [the Salutations to the Theotokos] continuously. Even when Holy Week came, and it is said «we don’t Salute the Panagia in Holy Week», but so great was the crowd that we read it throughout Holy Week. The Myrrh would run from the Icon at intervals several times a day. On Holy Pascha, it stopped running. During Renewal Week [the week after Pascha] it did not run, but it resumed during the week of Thomas in the same way. The color would change between four forms, as I said earlier, like a milky color, the color blue, a diamond color, and a yellow color that remained stable and did not change. Once I saw myself at the Midnight service that the Myrrh coming from the Panagia was blood red, and passed outside of the frame and stayed there. In the morning I woke up before the other Sisters and went to see the Icon and it was dry. After this it appeared as dried blood, but the aroma was always the same. When the icon would flow and hit the floor, it was like my sword poking my side, and I would go run to venerate the Panagia. I would gather the Myrrh from the floor. Sometimes the aroma of the Myrrh would permeate as waves, something that I perceived as something beyond nature. The aroma was not like a natural scent which would smell and then stop. The Aroma of the Myrrh of the Panagia is not like them, but is not held back going in or out, just as the Lord was not hindered by the seals or the stone at the Tomb [at His Divine Resurrection]. Thus nothing hindered the aroma and the Myrrh to flow inside or outside the frame, and it would come not in a physical manner, but in waves, and would not leave the slightest doubt in the unbelieving. No one was left untouched, and prayers and supplications and tears to the Panagia were made by all the Pilgrims, by everyone. The Bishop of Navplion was Chrysostomos after the death of Bishop [Despotis, literally Master, the traditional Orthodox greeting to the Bishop] Germanos Roumpani. He had just come, so instead the Bishop of Sparta, Kyprianos, came. He came here to our monastery, inspected the Icon, asked himself about the miracle and said «Blessed be the name of the Theotokos. May the miracle of the Theotokos spread». In 1969, the chief commander in Tripoli gendarmerie commander of the Astros, came and inspected the icon, and as he told the residents of Agios Petros, he found no hint at all of fraud, and that previously he was not God-fearing, but when he saw the miracle with his own eyes, he said: «A Great God exists ». And a Chemist from Tripoli took some Myrrh of the Panagia to perform a chemical analysis on it, and he beheld miraculous power, but he did not seen anything natural [or physical], and he cried out «A Great God exists». The Myrrh of the Panagia was for a few years as the way I said above. Though it appeared all-clean in the frame it gathered as large drops and came outside of the frame, it dripped, and we saw when it came out and ran down. We gathered it with cotton and gave it as a blessing to the world. A few years later, there was a great earthquake, and since that time it runs continuously in the frame, it is continuously drenched, it does not slow down, we wipe it up and in a few hours, again it is filled. The miracle of the Panagia was not known very far away. The local region and a little beyond only knew about it. After 6 years, Dimitrios Panagopoulos came in 1970, in the month of July from Athens, a pious man and a preacher of the divine word. Many people know him from his sermons and from his modest life. This preacher of the Divine Word spread the miracle of the Theotokos around the world in his monthly brochure called «Agia Marina». From then began to come pilgrims from the Capital, from all over Greece, and from the outside, and those who couldn’t come would send us a letter seeking the Holy Myrrh of the Panagia. The Holy Myrrh works miracles, many sick people have been healed. Since 1960 when she was made Abbess, she has built six churches. St. Neilos the Myrrhflowing, where the first cell of the Saint was. St. George at the cemetery. St. Charalampos in the metochion [dependency] of the Monastery at Korakovouni. 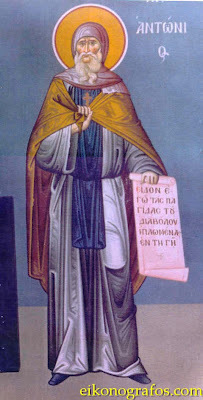 St. Nektarios. And recently she finished the large Church, which celebrates the Dormition of the Theotokos, the Holy Transfiguration of Christ, and the Entrance of the Theotokos to the Temple. And the lower church also has three dedications. On the Feast of the Panagia, like every year, we do a vigil service in the small church. This year, 1994, on August 15th the vigil took place in the Large Church, a beautiful, all-radiant and decorated church. 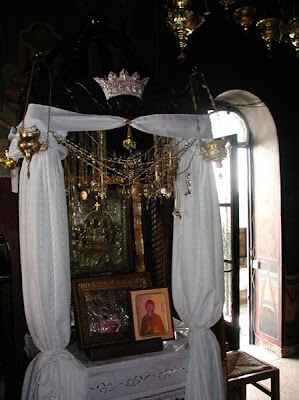 The wonderworking Icon of Panagia was moved to the veneration stand in the great church and it was venerated by all the people, the Christians. At 6 o'clock in the afternoon was the small Vespers, and at 9:30 at night the bells run harmoniously. There was chanting, ringing of bells at short intervals, and soon began Great Vespers, and after Vespers was Holy Unction. 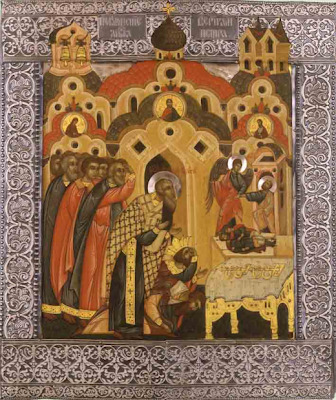 After the Holy Unction began Matins, the liti, the Six-psalms, the Polyeleos of Panagia, the kathismata, canons, and finishing the minologio we chanted the Engomia [lamentations] of the Panagia, katavasies, and the 9th ode, the Praises, and after the Doxology, we chanted “Holy God…” very slowly, and had the procession with the Epitaphio of the Panagia outside of the great church, all holding lit candles. And when the bells of the great church and the simandron of the small one rang festally, the large procession around the church began. 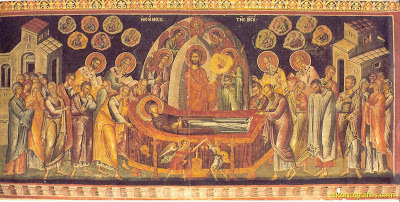 The small epitaphio was preceded by the Precious Cross and the gold banner of the Dormition of the Theotokos. The small candles and Sisters with Priests all chanted “Holy God…” in a festal manner while the bell-ringer rang during the procession of the Epitafio. Truly moving are these moments in the infinite silence of the night. At 5 in the morning the Divine Liturgy finished which was followed by a sermon for the feast of our Panagia. The Sisters and the Faithful will commune, and will go rest after the Divine Liturgy. At 7 o'clock we have a second Divine Liturgy because many Christians come from afar and can't make the Vigil that we follow, so there is another priest and they receive Holy Communion at the second Divine Liturgy. 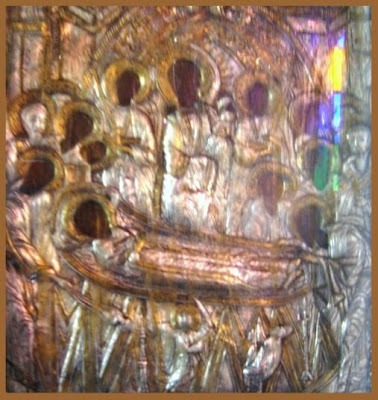 Apolytikion for the Dormition of the Theotokos - Tone 1. In giving birth you retained your virginity; in falling asleep, O Mother of God, you did not abandon the world. You passed over into life, you, the Mother of life; and by your prayers you deliver our souls from death. Come O faithful and joyously praise the All-Holy Virgin, for from Her Icon flows fragrant Myrrh, Come let us honor the miracle, and the Virgin let us venerate, and perform fervent supplications that she might deliver us from various troubles. 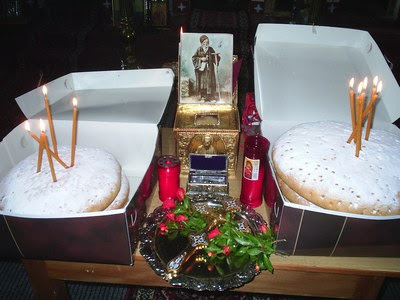 For the Paraklesis (Supplication) service to Panagia Malevi (in Greek), see: http://www.agiooros.net/forum/viewtopic.php?f=50&t=9533. 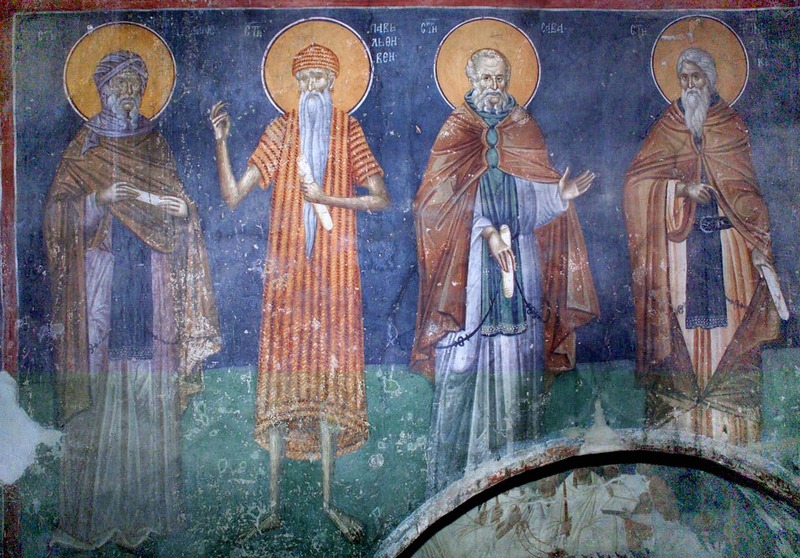 Saints Athanasius and Cyril were Archbishops of Alexandria. These wise teachers of truth and defenders of Christ's Church share a joint Feast in recognition of their dogmatic writings which affirm the truth of the Orthodox Faith, correctly interpret the Holy Scripture, and censure the delusions of the heretics. St Athanasius took part in the First Ecumenical Council when he was still a deacon. He surpassed everyone there in his zeal to uphold the teaching that Christ is consubstantial (homoousios) with the Father, and not merely a creature, as the Arians proclaimed. 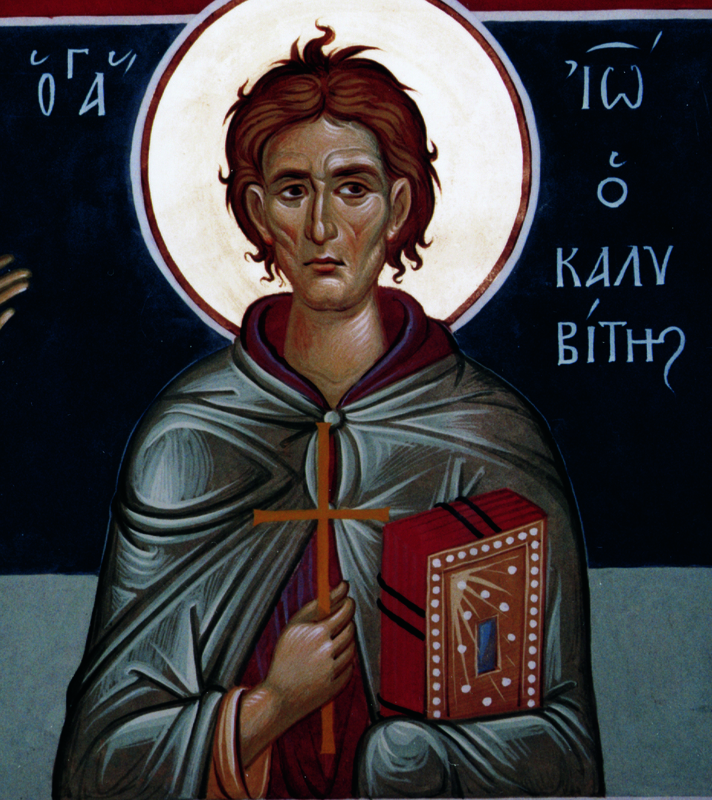 This radiant beacon of Orthodoxy spent most of his life in exile from his See, because of the plotting of his enemies. He returned to his flock as he was approaching the end of his life. Like an evening star, he illumined the Orthodox faithful with his words for a little while, then reposed in 373. He is also commemorated on May 2 (the transfer of his holy relics). Apolytikion of Sts. 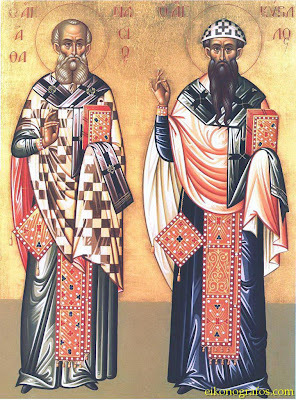 Athanasios and Cyril, Patriarchs of Alexandria in the Third ToneShining forth with works of Orthodoxy, ye quenched every false belief and teaching and became trophy-bearers and conquerors. And since ye made all things rich and with true piety, greatly adorning the Church with magnificence, Athanasius and wise Cyril, ye both have worthily found Christ God, Who doth grant great mercy unto all. 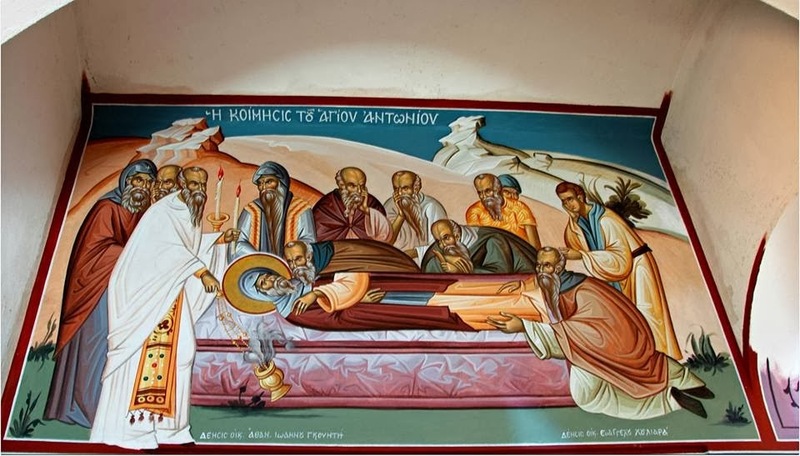 Kontakion in the Fourth ToneO great Hierarchs of piety and brave champions of the Church of Christ, you watch over all who sing, "Save us who in faith honor you, O Compassionate." 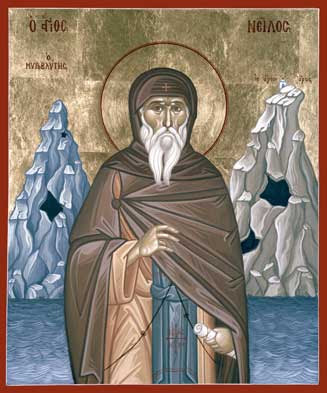 Yesterday (January 17th) we celebrated the feast of St. Anthony the Great. He is considered one of the major and first Fathers of the Monastic Life. The life of St. Anthony below is taken from: http://ocafs.oca.org/FeastSaintsViewer.asp from January 17th. 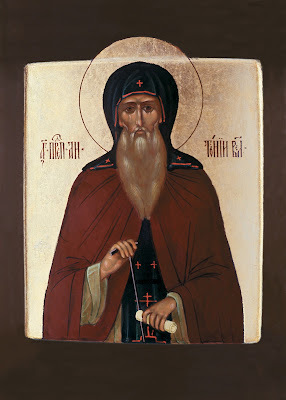 "Saint Anthony the Great is known as the Father of monasticism, and the long ascetical sermon in The Life of St Anthony by St Athanasius (Sections 16-34), could be called the first monastic Rule. He was born in Egypt in the village of Coma, near the desert of the Thebaid, in the year 251. His parents were pious Christians of illustrious lineage. Anthony was a serious child and was respectful and obedient to his parents. He loved to attend church services, and he listened to the Holy Scripture so attentively, that he remembered what he heard all his life. When St Anthony was about twenty years old, he lost his parents, but he was responsible for the care of his younger sister. Going to church about six months later, the youth reflected on how the faithful,in the Acts of the Apostles (4:35), sold their possessions and gave the proceeds to the Apostles for the needy. Then he entered the church and heard the Gospel passage where Christ speaks to the rich young man: "If you would be perfect, go, sell what you possess and give it to the poor, and you will have treasure in heaven; and come follow Me" (Mt.19:21). Anthony felt that these words applied to him. Therefore, he sold the property that he received after the death of his parents, then distributed the money to the poor, and left his sister in the care of pious virgins in a convent. Leaving his parental home, St Anthony began his ascetical life in a hut not far from his village. By working with his hands, he was able to earn his livelihood and also alms for the poor. Sometimes, the holy youth also visited other ascetics living in the area, and from each he sought direction and benefit. He turned to one particular ascetic for guidance in the spiritual life. In this period of his life St Anthony endured terrible temptations from the devil. The Enemy of the race of man troubled the young ascetic with thoughts of his former life, doubts about his chosen path, concern for his sister, and he tempted Anthony with lewd thoughts and carnal feelings. But the saint extinguished that fire by meditating on Christ and by thinking of eternal punishment, thereby overcoming the devil. Realizing that the devil would undoubtedly attack him in another manner, St Anthony prayed and intensified his efforts. Anthony prayed that the Lord would show him the path of salvation. And he was granted a vision. The ascetic beheld a man, who by turns alternately finished a prayer, and then began to work. This was an angel, which the Lord had sent to instruct His chosen one. St Anthony tried to accustom himself to a stricter way of life. He partook of food only after sunset, he spent all night praying until dawn. Soon he slept only every third day. But the devil would not cease his tricks, and trying to scare the monk, he appeared under the guise of monstrous phantoms. The saint however protected himself with the Life-Creating Cross. Finally the Enemy appeared to him in the guise of a frightful looking black child, and hypocritically declaring himself beaten, he thought he could tempt the saint into vanity and pride. The saint, however, vanquished the Enemy with prayer. For even greater solitude, St Anthony moved farther away from the village, into a graveyard. He asked a friend to bring him a little bread on designated days, then shut himself in a tomb. Then the devils pounced upon the saint intending to kill him, and inflicted terrible wounds upon him. By the providence of the Lord, Anthony's friend arrived the next day to bring him his food. Seeing him lying on the ground as if dead, he took him back to the village. They thought the saint was dead and prepared for his burial. At midnight, St Anthony regained consciousness and told his friend to carry him back to the tombs. St Anthony's staunchness was greater than the wiles of the Enemy. Taking the form of ferocious beasts, the devils tried to force the saint to leave that place, but he defeated them by trusting in the Lord. Looking up, the saint saw the roof opening, as it were, and a ray of light coming down toward him. The demons disappeared and he cried out, "Where have You been, O Merciful Jesus? Why didn't You appear from the very beginning to end my pain?" The Lord replied, "I was here, Anthony, but wanted to see your struggle. Now, since you have not yielded, I shall always help you and make your name known throughout all the world." After this vision St Anthony was healed of his wounds and felt stronger than before. He was then thirty-five years of age. 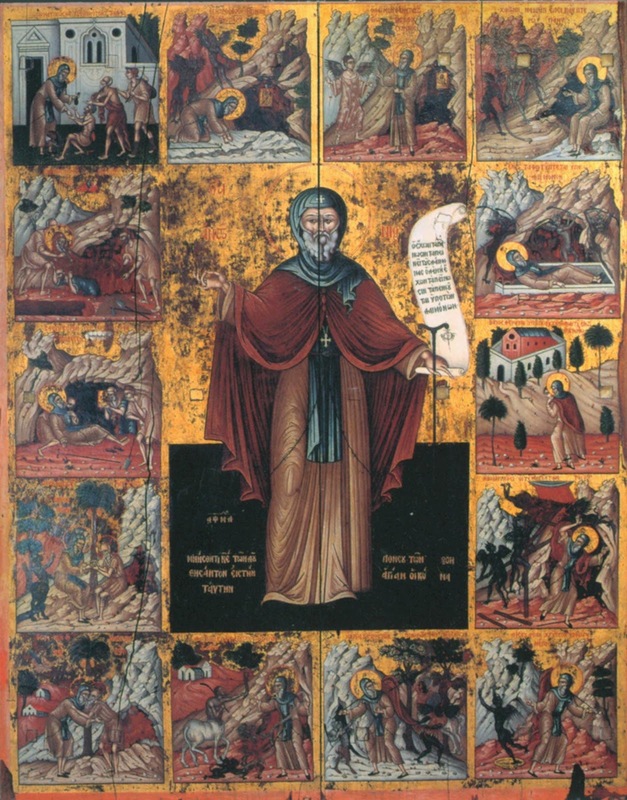 Having gained spiritual experience in his struggle with the devil, St Anthony considered going into the Thebaid desert to serve the Lord. He asked the Elder (to whom he had turned for guidance at the beginning of his monastic journey) to go into the desert with him. The Elder, while blessing him in the then as yet unheard of exploit of being a hermit, decided not to accompany him because of his age. St Anthony went into the desert alone. The devil tried to hinder him, by placing a large silver disc in his path, then gold, but the saint ignored it and passed by. He found an abandoned fort on the other side of the river and settled there, barricading the entrance with stones. His faithful friend brought him bread twice a year, and there was water inside the fort. St Anthony spent twenty years in complete isolation and constant struggle with the demons, and he finally achieved perfect calm. The saint's friends removed the stones from the entrance , and they went to St Anthony and besought him to take them under his guidance. Soon St Anthony's cell was surrounded by several monasteries, and the saint acted as a father and guide to their inhabitants, giving spiritual instruction to all who came into the desert seeking salvation. He increased the zeal of those who were already monks, and inspired others with a love for the ascetical life. He told them to strive to please the Lord, and not to become faint-hearted in their labors. He also urged them not to fear demonic assaults, but to repel the Enemy by the power of the Life-Creating Cross of the Lord. In the year 311 there was a fierce persecution against Christians, in the reign of the emperor Maximian. 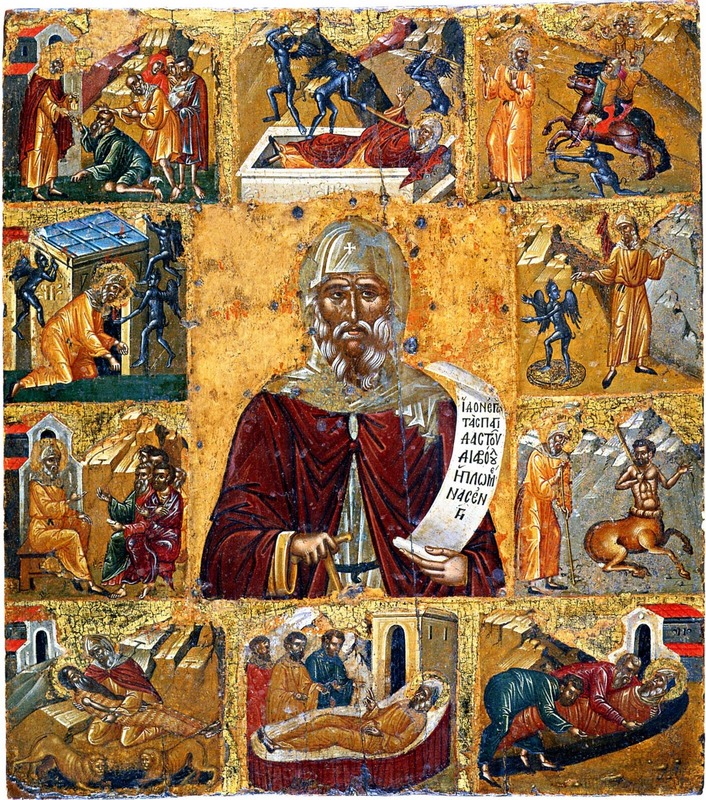 Wishing to suffer with the holy martyrs, St Anthony left the desert and went to Alexandria. He openly ministered to those in prison, he was present at the trial and interrogations of the confessors, and accompanying the martyrs to the place of execution. It pleased the Lord to preserve him, however, for the benefit of Christians. At the close of the persecution, the saint returned to the desert and continued his exploits. The Lord granted the saint the gift of wonderworking, casting out demons and healing the sick by the power of his prayer. The great crowds of people coming to him disrupted his solitude, and he went off still farther, into the inner desert where he settled atop a high elevation. But the brethren of the monasteries sought him out and asked him to visit their communities. Another time St Anthony left the desert and arrived in Alexandria to defend the Orthodox Faith against the Manichaean and Arian heresies. Knowing that the name of St Anthony was venerated by all the Church, the Arians said that he adhered to their heretical teaching. But St Anthony publicly denounced Arianism in front of everyone and in the presence of the bishop. During his brief stay at Alexandria, he converted a great multitude of pagans to Christ. People from all walks of life loved the saint and sought his advice. Pagan philosophers once came to Abba Anthony intending to mock him for his lack of education, but by his words he reduced them to silence. Emperor Constantine the Great (May 21) and his sons wrote to St Anthony and asked him for a reply. He praised the emperor for his belief in Christ, and advised him to remember the future judgment, and to know that Christ is the true King. St Anthony spent eighty-five years in the solitary desert. Shortly before his death, he told the brethren that soon he would be taken from them. He instructed them to preserve the Orthodox Faith in its purity, to avoid any association with heretics, and not to be negligent in their monastic struggles. "Strive to be united first with the Lord, and then with the saints, so that after death they may receive you as familiar friends into the everlasting dwellings." The saint instructed two of his disciples, who had attended him in the final fifteen years of his life, to bury him in the desert and not in Alexandria. He left one of his monastic mantles to St Athanasius of Alexandria (January 18), and the other to St Serapion of Thmuis (March 21). St Anthony died peacefully in the year 356, at age 105, and he was buried in the desert by his disciples. The Life of the famed ascetic St Anthony the Great was written by St Athanasius of Alexandria. This is the first biography of a saint who was not a martyr, and is considered to be one of the finest of St Athanasius' writings. St John Chrysostom recommends that this Life be read by every Christian. "These things are insignificant compared with Anthony's virtues," writes St Athanasius, "but judge from them what the man of God Anthony was like. From his youth until his old age, he kept his zeal for asceticism, he did not give in to the desire for costly foods because of his age, nor did he alter his clothing because of the infirmity of his body. He did not even wash his feet with water. He remained very healthy, and he could see well because his eyes were sound and undimmed. Not one of his teeth fell out, but near the gums they had become worn due to his advanced age. He remained strong in his hands and feet.... He was spoken of everywhere, and was admired by everyone, and was sought even by those who had not seen him, which is evidence of his virtue and of a soul dear to God." The following works of St Anthony have come down to us: Twenty Sermons on the virtues, primarily monastic (probably spurious). Seven Letters to various Egyptian monasteries concerning moral perfection, and the monastic life as a spiritual struggle. A Rule for monastics (not regarded as an authentic work of St Anthony). 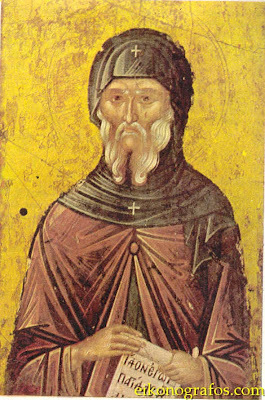 In the year 544 the relics of St Anthony the Great were transferred to Alexandria, and after the conquest of Egypt by the Saracens in the seventh century, they were transferred to Constantinople. The holy relics were transferred from Constantinople in the tenth-eleventh centuries to a diocese outside Vienna. In the fifteenth century they were brought to Arles (in France), to the church of St Julian." O Father Anthony, you imitated the zealous Elijah. You followed the straight paths of the Baptist and became a desert dweller. By prayer you confirmed the universe. Wherefore, intercede with Christ our God to save our souls. 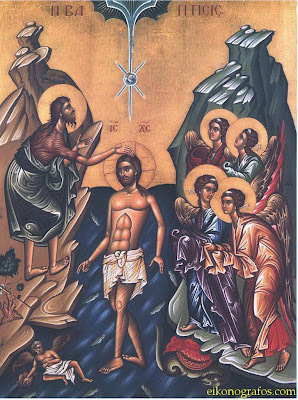 Forsaking the uproars of life O venerable one, you completed your life in quiet, fully imitating the Baptist. Therefore, we honor you with him, O Anthony, Father of Fathers. 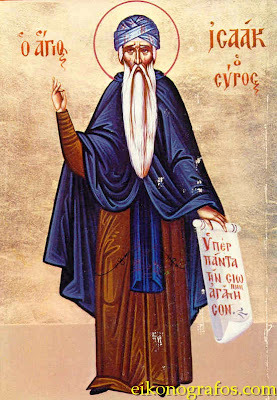 St. Anthony the Great, intercede for us! 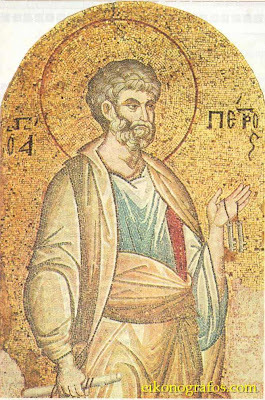 Yesterday (January 16th), our Church celebrates the Veneration and the many miracles which came about through the Precious Chains of the Apostle Peter. "Herod Agrippa, the grandson of Herod the Great and king of the Jews, grew wroth against the Church of Christ, and slew James, the brother of John the Evangelist. Seeing that this pleased the Jews, he took Peter also into custody and locked him up in prison, intending to keep him there until after the feast of the Passover, so that he could win the favour of the people by presenting him to them as a victim. But the Apostle was saved when he was miraculously set free by an Angel (Acts 12:1-19). The chains wherewith the Apostle was bound received from his most sacred body the grace of sanctification and healing, which is bestowed upon the faithful who draw nigh with faith. That such sacred treasures work wonders and many healings is witnessed by the divine Scripture, where it speaks concerning Paul, saying that the Christians in Ephesus had such reverence for him, that his handkerchiefs and aprons, taken up with much reverence, healed the sick of their maladies: "So that from his body were brought unto the sick handkerchiefs or aprons, and the diseases departed from them, and the evil spirits went out of them" (Acts 19:12). But not only the Apostles' clothing (which certainly touched the bodies of the sick), but even their shadow alone performed healings. 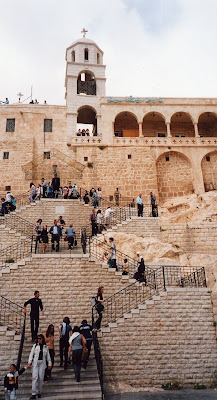 On beholding this, people put their sick on stretchers and beds and brought them out into the streets that, when Peter passed by, his shadow "might overshadow some of them"(Acts 5:15). From this the Orthodox Catholic [Catholic meaning "universal", not referring to Roman Catholicism] Church has learned to show reverence and piety not only to the relics of their bodies, but also in the clothing of God's Saints." "The Veneration of the Honorable Chains of the Holy and All-Praised Apostle Peter: In about the year 42, on the orders of Herod Agrippa, the Apostle Peter was thrown into prison for preaching about Christ the Savior. In prison he was held secure by two iron chains. During the night before his trial, an angel of the Lord removed these chains from the Apostle Peter and led him out from the prison (Acts 12:1-11). Christians who learned of the miracle took the chains and kept them as precious keepsakes. For three centuries the chains were kept in Jerusalem, and those afflicted with illness and approached them with faith received healing. Patriarch Juvenal (July 2) presented the chains to Eudokia, wife of the emperor Theodosius the Younger, and she in turn transferred them from Jerusalem to Constantinople in either the year 437 or 439. Eudokia sent one chain to Rome to her daughter Eudoxia (the wife of Valentinian), who built a church on the Esquiline hill dedicated to the Apostle Peter and placed the chain in it. There were other chains in Rome, with which the Apostle Peter was shackled before his martyrdom under the emperor Nero. These were also placed in the church. 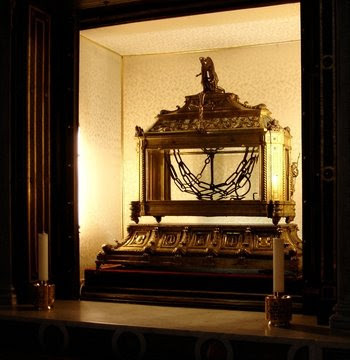 On January 16, the chains of St Peter are brought out for public veneration." Without leaving Rome, thou didst come to us by the precious chains which thou didst wear. O foremost of the Apostles. And worshipping them with faith, we pray: By thine intercessions with God, grant us great mercy. Now Christ God, the Rock, doth glorify the rock of faith, illustriously, in calling all to celebrate the dread wonders of the most precious chains of Peter, the first and chief of the disciples of Christ our God, Who granteth forgiveness of sins unto all. St. Peter the Apostle, intercede for us! "Our Holy Father Paul of Thebes. Born of wealthy parents in Lower Thebes in Egypt in the reign of the Emperor Decius, he and a sister of his together inherited all their parents' property. But his brother-,in-law, an idol-worshipper, plotted to seize Paul's half of the inheritance. He therefore threatened Paul that he would betray him to the authorities as a Christian if he did not hand over his share of the property. This misfortune, coupled with the examples of self-sacrifice by the Christian martyrs that Paul saw with his own eyes, induced him to give his half of the property to his sister and go of into the desert, where he lived in asceticism until his death. 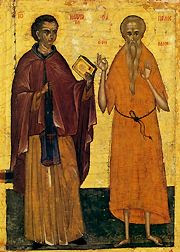 The spiritual heights attained by this giant of a monk are testified to by no less a person than St Antony the Great, who once visited Paul and saw how the wild animals and birds of the air ministered to him. Returning from this visit, Antony said to his monks: 'Woe is me, my children, a sinful and false monk, who am a monk in name only. 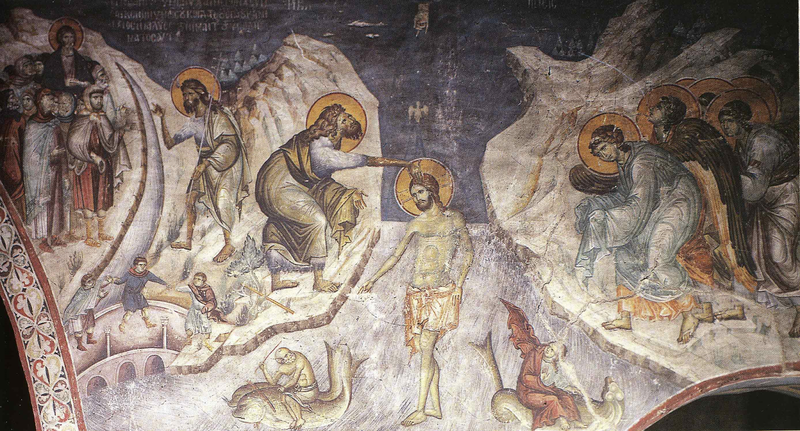 I have seen Elias, I have seen John in the desert, and I have seen Paul - in Paradise!' St Paul lived 113 years, and entered peacefully into rest in the Lord in the year 342. Our Holy Father John (The Hut-Dweller) [Kalyvites]. He was born in Constantinople in the early part of the 5th century, of rich and eminent parents whose only child he was. Drawn by inclination to the spiritual life, the young John fled with a monk to a monastery in Asia Minor. He spent six years in this monastery in the greatest restraint, prayer and obedience to the superior. Then the devil attacked him with the temptation to leave the monastery and return to his parents, to live with them as a nobleman. He indeed returned to his parents' home, but dressed as a beggar. He saw his parents, but, not wishing to reveal himself to them as their son, remained as a beggar in their courtyard, living off the crumbs that the servants threw him and enduring much ridicule from all. He lived thus for three years, praying God that He would save the souls of his father and mother. When he fell ill and felt death approaching, he revealed himself to his parents. They recognised him by a precious Gospel-book which they had given him in childhood and which he had kept with him as his sole possession. And so this young man, albeit so rich, saved his soul and those of his parents, overcame the devil and entered into rest in the Lord in about the year 450." O ye faithful, let us all laud the divine Paul, the bright luminary that shone at the virtues' lofty height; and let us joyously cry aloud: O Christ, Thou art the rejoicing of all the Saints. Since thou didst desire a poverty like unto Christ's, O wise Father John, thou didst forsake thy parents' wealth; and while holding in thy hands the most holy Gospel, O righteous one, thou didst follow after Christ God while ceaselessly praying to Him for us all. "You came and shone forth, O Light unapproachable." Kontakion for the Holy Feast of Theophany. Mode 4. Original Melody. You appeared to us on earth* today, O Master,* and Your light was signed on us * who cry aloud to You and say * with understanding, O Christ our God: You came and shone forth, O Light unapproachable. On Galilee of the Gentiles, on the region of Zebulòn and the land of Nephthalím, as the Prophet declared, a great light has shone, which is the Christ. Dark-dwellers have seen a radiant dawn shining out of Bethlehem, rather out of Mary, as the Lord—the Sun of Justice—breaks His rays o’er the whole of civilization. Come then, all unclothed offspring of Adam: let us put on Christ and thus keep warm. For, as a mantle for the denuded and a beacon to the be-darkened, You came and shone forth, O Light unapproachable. The account of this truly amazing miracle has been told in numerous places, but I thought to include it here also in case you haven't heard it yet. It should be a testement to the fact that our Faith is truly alive, and that the great miracles of the scriptures and the traditions of the Church are not fabrications, and that wonders that equal or exceed them continue to occur. For as Christ said, "Lo I am with you always, until the close of the age." The text of the story was taken from: http://www.pigizois.net/agglika/the_miracle_in_siria.htm. "In December 2004 a Saudi Arabian man, a Moslem, appeared before several new agencies to relate the following incredible event he experienced and which changed his life (this story appeared on TV, the Internet, radio, and was circulated in newspapers, magazines, and pamphlets throughout Saudi Arbia, Syria, Palestine, and evidently in all neighboring countries. 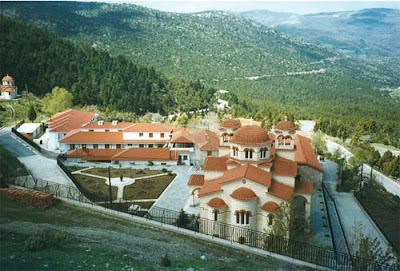 Immediately after this, the Saudi Arabian called his relatives to come to Syria and they all went together to the monastery of Panagia Saidnaya and offered up prayers, praises, and glorification, and instead of the initial gift of $80,000 US (which was promised), he gave $800,000 US to the Theotokos.Today, as this man relates the details of that overwhelming miracle, he starts his narration with "When I was a Moslem this happened to me" this indicating he is not longer a Moslem, as neither is his family.This miracle stunned with awesome surprise the entire Arabic/Moslem nation and all of the Middle East. Submitted and compiled by Very Rev. Archimandrite Nektarios SerfesBoise, Idaho USA. Eve of the Ascension of Lord, 8 June 2005. Glory to God for all things! Most holy Mother of God, save us! Peace to your souls! Humbly In Our Lord God,+Archimandrite Nektarios Serfes Who prays for you!" It is said that Justinian I, Emperor of Byzantium, while crossing Syria with his troops either on his way to the Holy Land or on a campaign against the Persians, came to this desert, where his army encamped and soon suffered thirst for lack of water. When they despaired, the emperor saw a beautiful gazelle off in the distance. He vigorously gave chase, hunting the animal until it tired and stopped on a rocky knoll and approached a spring of fresh water, but without giving the emperor the opportunity to shoot it. Suddenly, it transformed into an icon of the Most-holy Theotokos, which shone with a brilliant light. A white hand stretched forth from it and a voice said, "No, thou shalt not kill me, Justinian, but thou shalt build a church for me here on this hill." Then the strange heavenly light and majestic figure disappeared. Upon his return, Justinian related what he had seen to his subordinates and ordered them immediately to draw up a plan for the contemplated church. After some time had passed and the architects were unable to resolve the problems of the plan, the Holy Virgin — the gazelle — reappeared to Justinian in a dream and confided a magnificent plan to him for a convent, of which she would be the Protectress. It is said that the basic structure of the convent follows this plan to this day. The convent soon gained such renown that it came to be ranked second only to Jerusalem as a place of pilgrimage, and nuns from every corner of Syria, Egypt, and other lands flocked to it. 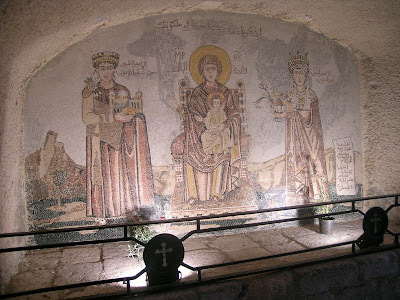 The holy Icon El Chagoura appeared many years after the convent was constructed. " In the late eighth century, a certain venerable Marina was abbess of the convent, and she was widely revered for her piety and sanctity of life. It happened that a hermit monk, a Greek pilgrim from Egypt named Theodore, stopped at the convent on his way to the Holy Land. When he was leaving, Abbess Marina asked him to buy in Jerusalem a precious and fine icon of the Holy Virgin. While at Jerusalem, he utterly forgot the task entrusted to him and started on his return journey. However, when he had not gone far from the city, he was stopped short by an unfamiliar voice: "Have you not forgotten something in Jerusalem? What have you done in regard to the commission from Abbess Marina?" 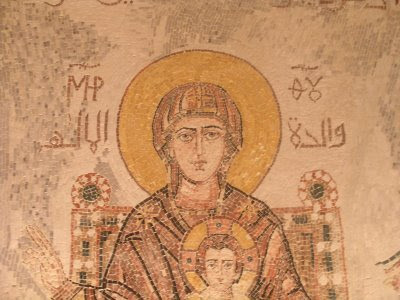 Monk Theodore returned at once to Jerusalem and found an icon of the Theotokos. During the journey back to the convent, he was astounded by the miracles accomplished through the icon. He and his whole caravan were ambushed by bandits, and then attacked by wild beasts. Amidst these dangers, the hermit always invoked the aid of the Holy Virgin while holding her icon, and he and all the caravan were saved from every peril. When Theodore returned to the convent, these events tempted him to keep the valuable icon for himself, and he decided to bypass Saidnaya and sail back to Egypt. However, he was unable to set sail, for such a fierce storm arose, it seemed the ship would inevitably sink. His conscience was pricked, and he quickly left the ship and returned by way of Saidnaya. After spending four days in the convent, he was again possessed by an irresistible desire to make the icon of the Mother of God his own. He apologized to the abbess, pretending that he had been unable to buy the required icon, and then he decided to leave the convent secretly. The next morning, as he was about to set out on the journey back to his own country and approached the convent gate, he was amazed to find that an invisible power barred his way, and it was as though a stone wall stood where the gate should have been. 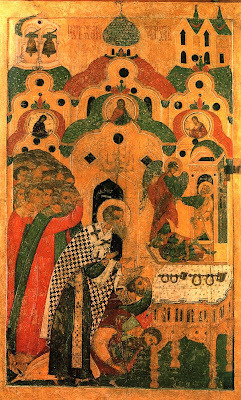 After many futile attempts, he was forced to hand the icon over to the abbess, confessing his intention. With tears of gratitude she glorified the Lord and His All-pure Mother. Since that day, the holy Icon has remained in the convent and has been the object of great veneration." Great are you, O Lord, and wonderful your works, and no word is adequate to sing the praise of your wonders. Glory to you, Lord, glory to you! 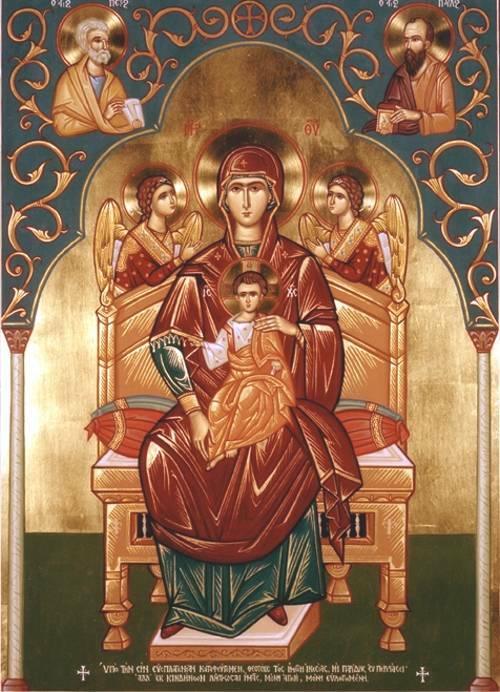 A fervent prayer, and wall most unshakable A merciful spring And shelter of all mankind; Fervently, we cry to you: Theotokos, our Lady, Come to us And from all dangers now deliver us The only protection who speeds to us. This is a quote selected by St. John the Hozevite (see: http://www.orthodoxphotos.com/Holy_Relics/St._John_Iacob_the_Hozevite/index.shtml) as being particularly beneficial for struggling Christians. It is quite sobering to me and my fellow sinners, and even if we are far from this state of the Saints, may we struggle to our end to reach the Kingdom of Heaven. "This is the will of the Holy Spirit, to be His beloved in continual reality. The Spirit of God does not dwell in those who live in rest because the Most-Good God wished that His beloved servants should not have rest in this life, but rather live in suffering, difficulties, worries, poverty, and nakedness, in solitude and debts, in sicknesses and defamations, in battles and crushing of heart, with sickly body and image detested by others, in a state which does not compare to other people's, and a lonely, peaceful, and quiet dwelling, completely invisible to men and free of anything that produces earthly consolation. Therefore, these people weep, and the world laughs; these sigh, but the world enjoys; these fast, but the world amuses itself. During the day, they wear themselves out; and, during the night, they prepare for deprivation. There are some who offer themselves to weariness voluntarily and also submit to afflictions; some are persecuted, while others were killed, and some hid in cellars. In them was fulfilled the word that says, "You will have afflictions, but in Me you will have joy," because the Lord knows that the ones who live in rest cannot remain in His love. Therefore, Christ the Saviour has prevented these from rest and satisfaction. He Whose love is more powerful than death of the body wanted to show also in us the power of His love. Amen."